On row machine, with knees slightly bent, back straight, grasp handles and pull back to just below the chest and then lower the weight back down, ending when your arms are nearly straight. There are many machines and ways to do Seated Rows (cable rows as pictured above are the most common but lever based machines are also widely available). The basic form (for straight-back) remains the same. A common variation is where you do bend forward at the waist at the top of the exercises. This brings the low back into the exercises and is less common these days due to fears, legitimate or not, that it can lead to low back injury. Most cable machines will provide a V-bar (as shown above). Regardless if you have the V-bar or just a straight bar, you want your grip to be with your palms facing one another. The back is straight with a slight arch in the lower back (push the chest out to get there). Knees need to be slightly bent to take pressure off of the knee joints and lower back. You want your body at a 90 degree angle to start the exercise, your arms nearly straight in front of you but not locked. Pull the bar all the way into your stomach keeping your elbows close to your sides. At the end of the exercise you can lean back very slightly to fully stretch the lats. But this is a slight bend at the waist, don’t go crazy and go all the way back and look like a dork. Don’t go forward past the 90 degree mark. Throughout the exercise, you want to concentrate on keeping the body still, only moving the working arms. Don’t let the knees or abs do any of the work, focus on using the lats to pull your elbows all the way back. One-Arm Seated Row – Same basic form using just one arm at a time. Seated High Row – This is done from a high pulley. Cable Incline Row – Done with a low pulley. Kneeling Cable Row – Like One-Arm Dumbbell Rows but with a cable machine. Cable Lying Row – Laying on your back and pulling the cable resistance down. 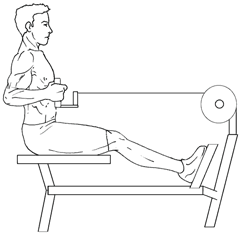 Other Machine-Based Seated Rows – Lever machines can offer a variation of the Seated Row. As shown above, there are many variations of the Seated Row that all hit the middle back and lats to some degree. They can all be acceptable substitutions. For free weight alternatives, the clear choices are the Barbell Bent-Over Rows and One-Arm Dumbbell Rows. (Main Page) Learn the strategies behind the weight gain/muscle building diets that pack on pounds. Find out about the different muscle fiber types and how to target and use progressive overload to force them to grow.